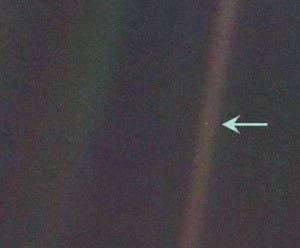 The Pale Blue Dot, left, was a picture taken by the Voyager 1 Spacecraft in 1990, showing the Earth from 6.1 billion kilometers (3.7 billion miles) away suspended in a sunbeam. In his classic on the place of planet earth in the Universe, Pale Blue Dot, Carl Sagan asked how is it that hardly any major religion has looked at science and said: "This is better than we thought. The Universe is much bigger than our prophets said, grander, more subtle, more elegant. Instead they say, 'No. no. no! My god is a little god, and I want him to stay that way." 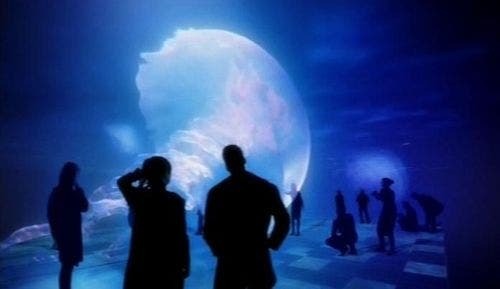 Carl Sagan dreamed of a world where a new religion that stressed the wonder and awe and magnificence of the Universe as revealed by science "might be able to draw forth reserves of reverence and awe hardly tapped by the conventional faiths." In a similar vein, Evolutionary Biologist Richard Dawkins debates physicist Lawrence Krauss ("The Physics of Star Trek") asks and answers some of the big questions about religion and our existence on Earth. A key focus is the impact of Darwin and "The Origin of the Species" on modern thought. Dawkins is the Charles Simonyi Professor of the Public Understanding of Science at Oxford University. He first came to prominence with his 1976 book The Selfish Gene, which popularized the gene-centered view of evolution and introduced the term meme into the lexicon. In 1982, he made a widely cited contribution to the science of evolution with the theory, presented in his book The Extended Phenotype, that phenotypic effects are not limited to an organism's body but can stretch far into the environment, including into the bodies of other organisms.